By default, the Software Update Service, long a part of macOS Server, is hidden. This indicates the service is not likely to be long for this world. However, many an organization still likes to leverage cooling off periods for their Mac fleet, as they should given a certain scale. To see the service, once you’ve installed the Server app, open the Server app and then from the View menu, select Software Update. You’ll then see the Software Update service. If you click off of the service and close the app, it will be hidden again. If you enable the service, you will then see it each time you open the Server app. We’ll get into enabling the Software Update service in a bit. The software patching configuration built into most operating systems is configured so all that a user has to do is open a box at home, join the network and start using the computer right away. As environments grow from homes to small offices and then small offices grow into enterprises, at some point software updates and patches need to be managed centrally. macOS heavily leverages the App Store. This allows administrators to pretty much be hands off when it comes to managing updates. But some environments need to control the flow of updates anyway. Apple has had this ability since the early days of OS X and in macOS, you can still control software update servers, which look at XML feeds on Apple servers, and allows or denies access to those updates, and then optionally syncs updates to a server at your office. That’s called the Software Update service. Apple also has a service called Caching, now built into all client operating systems. The Caching service also caches apps from the App Store and optionally content. This is built into the Sharing System Preference pane. But first, you’ll need to configure and start the Software Update service. Lucky you, it’s quick (although quick in a hurry up and wait kind of way). To get started, open the Server app and then click on the Software Update service. One of the biggest drawbacks of the Software Update service in OS X El Capitan Server in my opinion is the fact that it does not allow for serving 3rd party packages (not that Apple has much control over this, since these aren’t sourced from the App Store), from vendors such as Microsoft or Adobe. To provide those vendors with a manifest file and a quick little path option to add those manifest files, a nice middle ground could be found between the Mac App Store and the built in software update options in macOS. But then, we wouldn’t want to make it too easy. Another issue many have had is that users need administrative passwords to run updates and don’t have them (technically this isn’t a problem with the macOS Server part of the stack, but it’s related). While many options have come up for this, one is to just run the softwareupdate command for clients via ARD or a similar tool. Many environments have used these issues to look at tools such as Reposado or third party patch management tools such as JAMF Software’s Jamf Pro (JAMF also makes a reposado-based VM that mimics the swupdate options), FileWave, and others (or a combination of some of these). Overall, the update service in Server 5 is easily configured, easily managed and easily deployed to clients but slowly being replaced with the App Store and release management via MDM-based commands. The software patching configuration built into most operating systems is configured so all that a user has to do is open a box at home, join the network and start using the computer right away. As environments grow from homes to small offices and then small offices grow into enterprises, at some point software updates and patches need to be managed centrally. Yosemite Server (OS X Server 3), as with its OS X Server predecessors has a Software Update service. The service in the Server app is known as Software Update and from the command line is known as swupdate. The Software Update service, by default, stores each update in the /var/db/swupd directory. The Software Update servie is actually comprised of three components. The first is an Apache server, invoked by the /Applications/Server.app/Contents/ServerRoot/System/Library/LaunchDaemons/com.apple.swupdate.host.plist LaunchDaemon. This LaunchDaemon invokes a httpd process and clients access updates from the server based on a manifest of updates available in the sucatalog. These are synchronized with Apple Software Updates via /Applications/Server.app/Contents/ServerRoot/usr/sbin/swupd_syncd, the LaunchDaemon for swupdate at /Applications/Server.app/Contents/ServerRoot/System/Library/LaunchDaemons/com.apple.swupdate.sync.plist. The Apache version is now Apache/2.2.22. Clients can be pointed at the server then via a Profile or using the defaults command to edit the /Library/Preferences/com.apple.SoftwareUpdate.plist file. The contents of this file can be read using the following command: defaults read /Library/Preferences/com.apple.SoftwareUpdate.plist To point a client to a server via the command line, use a command such as the following: sudo defaults write /Library/Preferences/com.apple.SoftwareUpdate CatalogURL http://yosemitesamserver.pretendco.lan:8088/index.sucatalog But first, you’ll need to configure and start the Software Update service. Lucky you, it’s quick (although quick in a hurry up and wait kind of way). To get started, open the Server app and then click on the Software Update service. By default, updates are set to simply mirror the Apple servers, by default, enabling each update that Apple publishes, effectively proxying updates. You can use the Manual button if you would like to configure updates to either manually be approved and manually synchronized or just manually approved but automatically copied from Apple. Otherwise click on the ON button and wait for the updates to cache to simply mirror the Apple servers. If you would like to manually configure updates, click on the Manual option and then click on the Updates tab. The first item in the Updates tab is the “Automatically download new updates” checkbox. This option downloads all of the updates but does not enable them. The Updates tab also displays all available updates. click on one and then click on the cog-wheel icon towards the bottom of the screen to configure its behavior (Download, Enable, Disable, Remove and View Update). Note: The only option for updates in an Automatic configuration environment is disable. The service can be managed using serveradmin. To start Software Update, use the start option, followed by the swupdate service identifier: sudo serveradmin start swupdate To stop the service, replace start with stop: sudo serveradmin stop swupdate To see the status of the service, including the location of updates, the paths to log files, when the service was started and the number of updates running, use the fullstatus option: sudo serveradmin fullstatus swupdate The output of which appears as follows: swupdate:state = "RUNNING"
swupdate:checkError = no swupdate:updatesDocRoot = "/Library/Server/Software Update/Data/"
swupdate:autoEnable = no There are also a number of options available using the serveradmin settings that aren’t exposed to the Server app. These include a feature I used to use a lot in the beginning of deployments with poor bandwidth, only mirroring new updates, which is available to swupdate via the autoMirrorOnlyNew option. To configure: sudo serveradmin settings swupdate:autoMirrorOnlyNew = yes Also, the service can throttle bandwidth for clients. To use this option, run the following command: sudo serveradmin settings swupdate:limitBandwidth = yes And configure bandwidth using the syncBandwidth option, as follows: sudo serveradmin settings swupdate:syncBandwidth = 10 To automatically sync updates but not enable them (as the checkboxes allow for in the Server app, use the following command: sudo serveradmin settings swupdate:autoEnable = no The port (by default 8088) can be managed using the portToUse option, here being used to set it to 80 (clients need this in their catalog URL from here on out): sudo serveradmin settings swupdate:portToUse = 80 Finally, administrators can purge old packages that are no longer needed using the PurgeUnused option: sudo serveradmin swupdate:PurgeUnused = yes One of the biggest drawbacks of the Software Update service in OS X Yosemite Server in my opinion is the fact that it does not allow for serving 3rd party packages, from vendors such as Microsoft or Adobe. To provide those vendors with a manifest file and a quick little path option to add those manifest files, a nice middle ground could be found between the Mac App Store and the built in software update options in OS X. But then, we wouldn’t want to make it too easy. Another issue many have had is that users need administrative passwords to run updates and don’t have them (technically this isn’t a problem with the OS X Server part of the stack, but it’s related). While many options have come up for this, one is to just run the softwareupdate command for clients via ARD or a similar tool. Many environments have used these issues to look at tools such as Reposado or third party patch management tools such as JAMF Software’s the Casper Suite (JAMF also makes a reposado-based VM that mimics the swupdate options), FileWave, Absolute Manage and others. Overall, the update service in Yosemite Server is easily configured, easily managed and easily deployed to clients. It is what it needs to be for a large percentage of OS X Yosemite (10.10) Server administrators. This makes it a very viable option and if you’ve already got a Mountain Lion computer sitting around with clients not yet using a centralized update server, well worth enabling. The software patching configuration built into most operating systems is configured to open a box at home, join your network and start using the computer right away. As environments grow from homes to offices and then offices grow into enterprises, at some point software updates and patches need to be managed centrally. 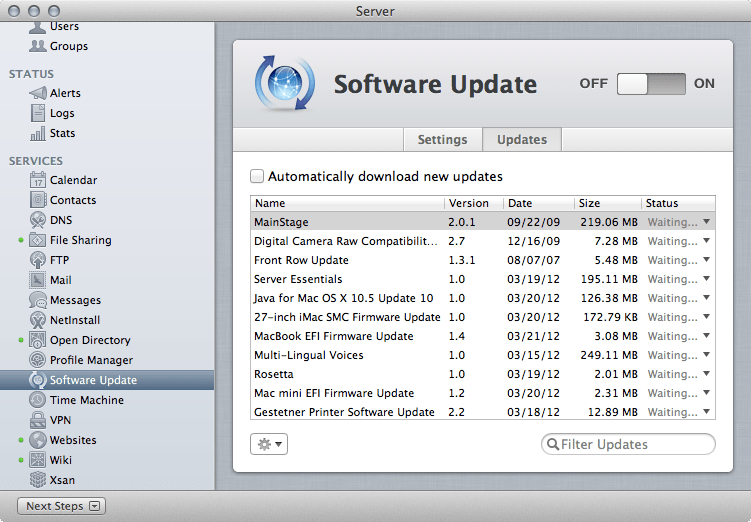 Mountain Lion, as with its OS X Server predecessors has a Software Update service. The service in the Server app is known as Software Update and from the command line is known as swupdate. The Software Update service, by default, stores each update in the /var/db/swupd directory. The Software Update servie is actually comprised of three components. The first is an Apache server, invoked by the /Applications/Server.app/Contents/ServerRoot/System/Library/LaunchDaemons/com.apple.swupdate.host.plist LaunchDaemon. This LaunchDaemon invokes a httpd process and clients access updates from the server based on a manifest of updates available in the sucatalog. These are synchronized with Apple Software Updates via /Applications/Server.app/Contents/ServerRoot/usr/sbin/swupd_syncd, the LaunchDaemon for swupdate at /Applications/Server.app/Contents/ServerRoot/System/Library/LaunchDaemons/com.apple.swupdate.sync.plist. The Apache version is now Apache/2.2.22. Clients can be pointed at the server then via a Profile or using the defaults command to edit the /Library/Preferences/com.apple.SoftwareUpdate.plist file. The contents of this file can be read using the following command: defaults read /Library/Preferences/com.apple.SoftwareUpdate.plist To point a client to a server via the command line, use a command such as the following: sudo defaults write /Library/Preferences/com.apple.SoftwareUpdate CatalogURL http://updates.krypted.com:8088/index.sucatalog But first, you’ll need to configure and start the Software Update service. Lucky you, it’s quick (although quick in a hurry up and wait kind of way). 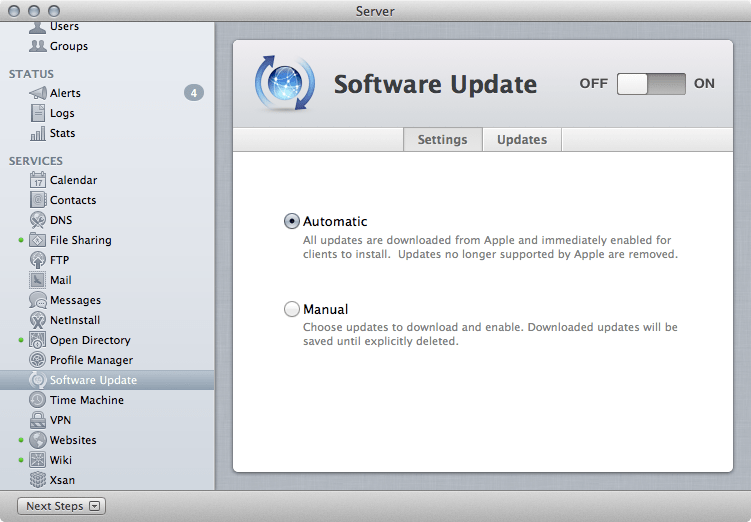 To get started, open the Server app and then click on the Software Update service. By default, updates are set to simply mirror the Apple servers, by default, enabling each update that Apple publishes, effectively proxying updates. You can use the Manual button if you would like to configure updates to either manually be approved and manually synchronized or just manually approved but automatically copied from Apple. Otherwise click on the ON button and wait for the updates to cache to simply mirror the Apple servers. If you would like to manually configure updates, click on the Manual option and then click on the Updates tab. The first item in the Updates tab is the “Austomatically download new updates” checkbox. This option downloads all of the updates but does not enable them. The Updates tab also displays all available updates. click on one and then click on the cog-wheel icon towards the bottom of the screen to configure its behavior (Download, Enable, Disable, Remove and View Update). Note: The only option for updates in an Automatic configuration environment is disable. The service can be managed using serveradmin. To start Software Update, use the start option, followed by the swupdate service identifier: sudo serveradmin start swupdate To stop the service, replace start with stop: sudo serveradmin stop swupdate To see the status of the service, including the location of updates, the paths to log files, when the service was started and the number of updates running, use the fullstatus option: sudo serveradmin fullstatus swupdate The output of which appears as follows: swupdate:state = "RUNNING" swupdate:lastChecktime = 2012-08-04 17:04:45 +0000 swupdate:syncStatus = "DONE" swupdate:syncServiceState = "RUNNING" swupdate:setStateVersion = 1 swupdate:lastProductsUpdate = 2012-08-04 17:07:10 +0000 swupdate:logPaths:swupdateAccessLog = "/var/log/swupd/swupd_access_log" swupdate:logPaths:swupdateErrorLog = "/var/log/swupd/swupd_error_log" swupdate:logPaths:swupdateServiceLog = "/var/log/swupd/swupd_syncd_log" swupdate:readWriteSettingsVersion = 1 swupdate:checkError = no swupdate:pluginVers = "10.8.91 (91)" swupdate:updatesDocRoot = "/var/db/swupd/" swupdate:hostServiceState = "RUNNING" swupdate:autoMirror = no swupdate:numOfEnabledPkg = 0 swupdate:servicePortsAreRestricted = "NO" swupdate:numOfMirroredPkg = 0 swupdate:autoMirrorOnlyNew = no swupdate:startTime = 2012-08-04 17:04:45 +0000 swupdate:autoEnable = no There are also a number of options available using the serveradmin settings that aren’t exposed to the Server app. These include a feature I used to use a lot in the beginning of deployments with poor bandwidth, only mirroring new updates, which is available to swupdate via the autoMirrorOnlyNew option. To configure: sudo serveradmin settings swupdate:autoMirrorOnlyNew = yes Also, the service can throttle bandwidth for clients. To use this option, run the following command: sudo serveradmin settings swupdate:limitBandwidth = yes And configure bandwidth using the syncBandwidth option, as follows: sudo serveradmin settings swupdate:syncBandwidth = 10 To automatically sync updates but not enable them (as the checkboxes allow for in the Server app, use the following command: sudo serveradmin settings swupdate:autoEnable = no The port (by default 8088) can be managed using the portToUse option, here being used to set it to 80 (clients need this in their catalog URL from here on out): sudo serveradmin settings swupdate:portToUse = 80 Finally, administrators can purge old packages that are no longer needed using the PurgeUnused option: sudo serveradmin swupdate:PurgeUnused = yes One of the biggest drawbacks of the Software Update service in OS X Mountain Lion Server in my opinion is the fact that it does not allow for serving 3rd party packages, from vendors such as Microsoft or Adobe. To provide those vendors with a manifest file and a quick little path option to add those manifest files, a nice middle ground could be found between the Mac App Store and the built in software update options in OS X. But then, we wouldn’t want to make it too easy. Another issue many have had is that users need administrative passwords to run updates and don’t have them (technically this isn’t a problem with the OS X Server part of the stack, but it’s related). While many options have come up for this, one is to just run the softwareupdate command for clients via ARD or a similar tool. Many environments have used these issues to look at tools such as reposado or third party patch management tools such as JAMF Software’s the Casper Suite (JAMF also makes a reposado-based VM that mimics the swupdate options), FileWave, Absolute Manage and others. 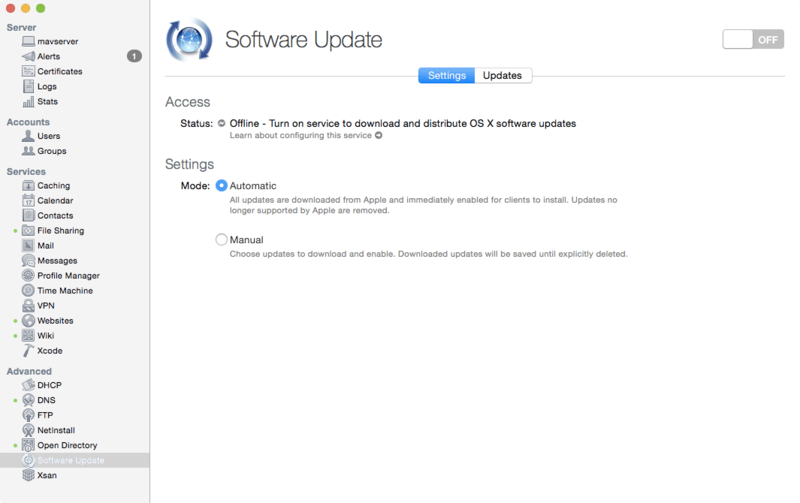 Overall, the update service in Mountain Lion is easily configured, easily managed and easily deployed to clients. It is what it needs to be for a large percentage of OS X Mountain Lion (10.8) Server administrators. This makes it a very viable option and if you’ve already got a Mountain Lion computer sitting around with clients not yet using a centralized update server, well worth enabling. 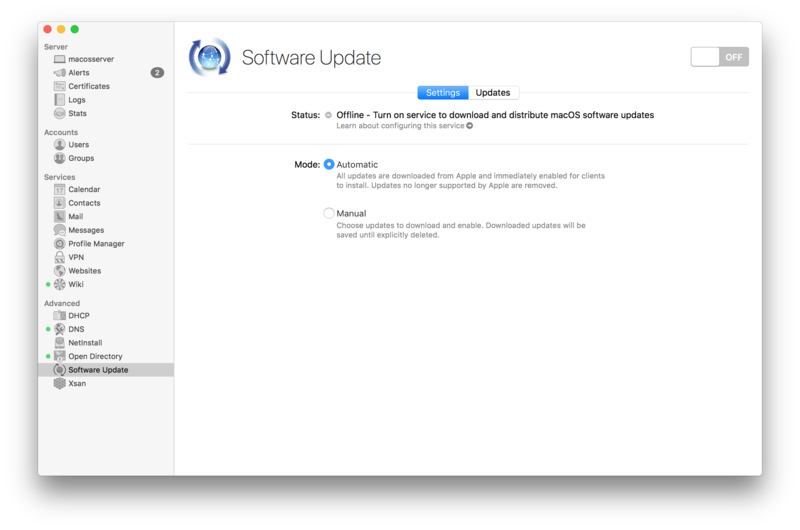 Note: Managing multiple Software Update Servers has changed in OS X Mountain Lion Server, see my previous post for more information on these changes.